Announcing WeVerify: an algorithm-supported method for digital content verification. The WeVerify platform will provide an independent and community driven environment for the verification of online content, with further verification provided by expert partners. Prof. Kalina Bontcheva will be serving as the Scientific Director of the project. Online disinformation and fake media content have emerged as a serious threat to democracy, economy and society. Content verification is currently far from trivial, even for experienced journalists, human rights activists or media literacy scholars. Moreover, recent advances in artificial intelligence (deep learning) have enabled the creation of intelligent bots and highly realistic synthetic multimedia content. Consequently, it is extremely challenging for citizens and journalists to assess the credibility of online content, and to navigate the highly complex online information landscapes. 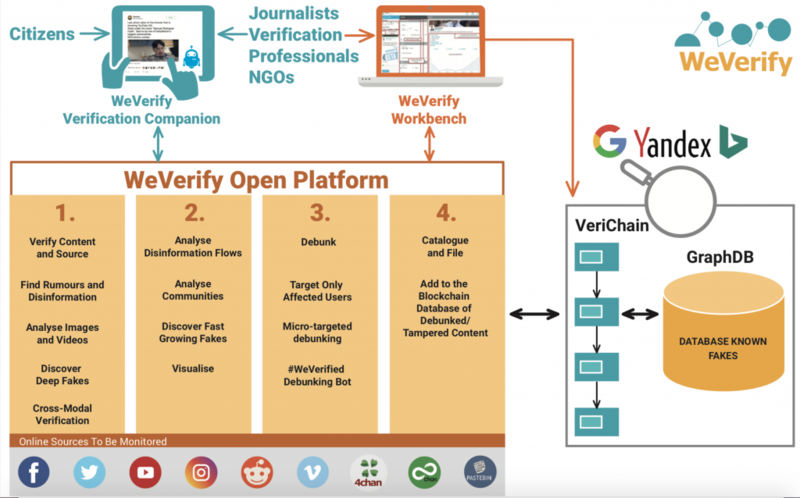 WeVerify aims to address the complex content verification challenges through a participatory verification approach, open source algorithms, low-overhead human-in-the-loop machine learning and intuitive visualizations. Social media and web content will be analysed and contextualised within the broader online ecosystem, in order to expose fabricated content, through cross-modal content verification, social network analysis, micro-targeted debunking and a blockchain-based public database of known fakes. Add captionA key outcome will be the WeVerify platform for collaborative, decentralised content verification, tracking, and debunking. The platform will be open source to engage communities and citizen journalists alongside newsroom and freelance journalists. To enable low-overhead integration with in-house content management systems and support more advanced newsroom needs, a premium version of the platform will also be offered. It will be furthermore supplemented by a digital companion to assist with verification tasks. Results will be validated by professional journalists and debunking specialists from project partners (DW, AFP, DisinfoLab), external participants (e.g. members of the First Draft News network), the community of more than 2,700 users of the InVID verification plugin, and by media literacy, human rights and emergency response organisations. The WeVerify website can be found at https://weverify.eu/, and WeVerify can be found on Twitter @WeV3rify! It is approaching that time of the year again! The GATE training course will be held from 17-21 June 2019 at the University of Sheffield, UK. No previous experience or programming expertise is necessary, so it's suitable for anyone with an interest in text mining and using GATE, including people from humanities backgrounds, social sciences, etc. This event will follow a similar format to that of the 2018 course, with one track Monday to Thursday, and two parallel tracks on Friday, all delivered by the GATE development team. You can read more about it and register here. Early bird registration is available at a discounted rate until 1 May. These two modules are run in parallel, so you can only attend one of them. You will need to have some programming experience and knowledge of Java to follow Module 5 on the Friday. No particular expertise is needed for Module 6. Hope to see you in Sheffield in June! GATE Cloud is GATE, the world-leading text-analytics platform, made available on the web with both human user interfaces and programmatic ones. My name is David Jones and part of my role is to make it easier for you to use GATE. This article is aimed at Python programmers and people who are, rightly, curious to see if Python can help with their text analysis work. GATE Cloud exposes a web API for many of its services. In this article, I'm going to sketch an example in Python that uses the GATE Cloud API to ANNIE, the English Named Entity Recognizer. I'm writing in Python 3 using the really excellent requests library. The GATE Cloud API documentation describes the general outline of using the API, which is that you make an HTTP request setting particular headers. The full code that I'm using is available on GitHub and is installable and runnable. A simple use is to pass text to ANNIE and get annotated results back. text = "David Jones joined the University of Sheffield this year"
The Content-Type header is required and specifies the MIME type of the text we are sending. In this case it's text/plain but GATE Cloud supports many types including PDF, HTML, XML, and Twitter's JSON format; details are in the GATE Cloud API documentation. }The JSON returned here is designed to have a similar structure to the format used by Twitter: Tweet JSON. The outermost dictionary has a text key and an entities key. The entities object is a dictionary that contains arrays of annotations of different types; each annotation being a dictionary with an indices key and other metadata. I find this kind of thing is impossible to describe and impossible to work with until I have an example and half-working code in front of me. Person : David JonesWe can see that ANNIE has correctly picked out a date, an organisation, and a person, from the text. It's worth noting that the JSON output has more detail that I'm not using in this example: "University of Sheffield" is identified as a university; "David Jones" is identified with the gender "male". requests has a response.json() method which is a shortcut for parsing the JSON into Python objects. the JSON response has a text field, which is the text that was analysed (in my example they are the same, but for PDF we need the linear text so that we can unambiguously assign index values within it). the JSON response has an entities field, which is where all the annotations are, first separated and keyed by their annotation type. the indices returned in the JSON are 0-based end-exclusive which matches the Python string slicing convention, hence we can use response_text[i:j] to get the correct piece of text. The public service has a fairly limited quota, but if you create an account on GATE Cloud you can create an API key which will allow you to access the service with increased quota and fewer limits. The nice thing about this is that requests will find and use these values automatically without you having to write any code. Go try using the web API now, and let us know how you get on! Referendum resultAlthough the UK voted by a narrow margin in the UK EU membership referendum in 2016 to leave the EU, that outcome failed to capture the diverse feelings held in various regions. It's a curious observation that the UK regions with the most economic dependence on the EU were the regions more likely to vote to leave it. The image below on the right is taken from this article from the Centre for European Reform, and makes the point in a few different ways. This and similar research inspired a current project the GATE team are undertaking with colleagues in the Geography and Journalism departments at Sheffield University, under the leadership of Miguel Kanai and with funding from the British Academy, aiming to understand whether lack of awareness of individual local situation played a role in the referendum outcome. Our Brexit tweet corpus contains tweets collected during the run-up to the Brexit referendum, and we've annotated almost half a million accounts for Brexit vote intent with a high accuracy. You can read about that here. So we thought we'd be well positioned to bring some insights. We also annotated user accounts with location: many Twitter users volunteer that information, though there can be a lot of variation on how people describe their location, so that was harder to do accurately. We also used local and national news media corpora from the time of the referendum, in order to contrast national coverage with local issues are around the country. "People's resistance to propaganda and media‐promoted ideas derives from their close ties in real communities"
Jean SeatonUsing topic modelling and named entity recognition, we were able to look for similarities and differences in the focus of local and national media and Twitter users. The bar chart on the left gets us started, illustrating that foci differ between media. Twitter users give more air time than news media to trade and immigration, whereas local press takes the lead on employment, local politics and agriculture. National press gives more space to terrorism than either Twitter or local news. NER diff between national and local pressOn the right is just one of many graphs in which we unpack this on a region-by-region basis (you can find more on the project website). In this choropleth, red indicates that the topic was significantly more discussed in national press than in local press in that area, and green indicates that the topic was significantly more discussed in local press there than in national press. Terrorism and immigration have perhaps been subject to a certain degree of media and propaganda inflation--we talk about this in our Social Informatics paper. Where media focus on locally relevant issues, foci are more grounded, for example in practical topics such as agriculture and employment. We found that across the regions, Twitter remainers showed a closer congruence with local press than Twitter leavers. The graph on the right shows the number of times a newspaper was linked on Twitter, contrasted against the percentage of people that said they read that newspaper in the British Election Study. It shows that the dynamics of popularity on Twitter are very different to traditional readership. This highlights a need to understand how the online environment is affecting the news reportage we are exposed to, creating a market for a different kind of material, and a potentially more hostile climate for quality journalism, as discussed by project advisor Prof. Jackie Harrison here. Furthermore, local press are increasingly struggling to survive, so it feels important to highlight their value through this work. You can see more choropleths on the project website. There's also an extended version here of an article currently under review. SemEval 2019 recently launched the Hyperpartisan News Detection Task in order to evaluate how well tools could automatically classify hyperpartisan news texts. The idea behind this is that "given a news text, the system must decide whether it follows a hyperpartisan argumentation, i.e. whether it exhibits blind, prejudiced, or unreasoning allegiance to one party, faction, cause, or person." Below we see an example of (part of) two news stories about Donald Trump from the challenge data. The one on the left is considered to be hyperpartisan, as it shows a biased kind of viewpoint. The one on the right simply reports a story and is not considered hyperpartisan. The distinction is difficult even for humans, because there are no exact rules about what makes a story hyperpartisan. In total, 322 teams registered to take part, of which 42 actually submitted an entry, including the GATE team consisting of Ye Jiang, Xingyi Song and Johann Petrak, with guidance from Kalina Bontcheva and Diana Maynard. The main performance measure for the task is accuracy on a balanced set of articles, though additionally precision, recall, and F1-score were measured for the hyperpartisan class. In the final submission, the GATE team's hyperpartisan classifying algorithm achieved 0.822 accuracy for manually annotated evaluation set, and ranked in first position in the final leader board. Our winning system was based on using sentence representations from averaged word embeddings generated from the pre-trained ELMo model with a Convolutional Neural Network and Batch Normalization for training on the provided dataset. 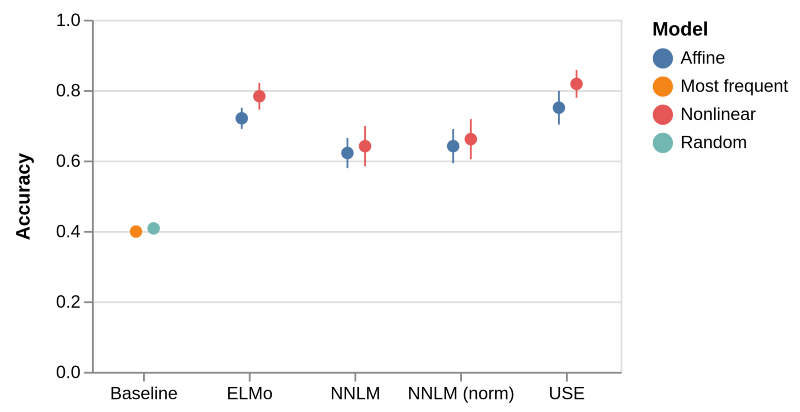 An averaged ensemble of models was then used to generate the final predictions. The source code and full system description is available on github. One of the major challenges of this task is that the model must have the ability to adapt to a large range of article sizes. Most state-of-the-art neural network approaches for document classification use a token sequence as network input, but such an approach in this case would mean either a massive computational cost or loss of information, depending on how the maximum sequence length. We got around this problem by first pre-calculating sentence level embeddings as the average of word embeddings for each sentence, and then representing the document as a sequence of these sentence embeddings. We also found that actually ignoring some of the provided training data (which was automatically generated based on the document publishing source) improved our results, which leads to important conclusions about the trustworthiness of training data and its implications. Overall, the ability to do well on the hyperpartisan news prediction task is important both for improving knowledge about neural networks for language processing generally, but also because better understanding of the nature of biased news is critical for society and democracy. When Twitter shared a large archive of propaganda tweets late in 2018 we were excited to get access to over 9 million tweets from almost 4 thousand unique Twitter accounts controlled by Russia's Internet Research Agency. The tweets are posted in 57 different languages, but most are in Russian (53.68%) and English (36.08%). Average account age is around four years, and the longest accounts are as much as ten years old. A large amount of activity in both the English and Russian accounts is given to news provision. Secondly, many accounts seem to engage in hashtag games, which may be a way to establish an account and get some followers. Of particular interest however are the political trolls. Left trolls pose as individuals interested in the Black Lives Matter campaign. Right trolls are patriotic, anti-immigration Trump supporters. Among left and right trolls, several have achieved large follower numbers and even a degree of fame. Finally there are fearmonger trolls, that propagate scares, and a small number of commercial trolls. The Russian language accounts also divide on similar lines, perhaps posing as individuals with opinions about Ukraine or western politics. These categories were proposed by Darren Linvill and Patrick Warren, from Clemson University. In the word clouds below you can see the hashtags we found left and right trolls using. Right Troll HashtagsMehmet E. Bakir has created some interactive graphs enabling us to explore the data. In the network diagram at the start of the post you can see the network of mention/retweet/reply/quote counts we created from the highly followed accounts in the set. You can click through to an interactive version, where you can zoom in and explore different troll types. In the graph below, you can see activity in different languages over time (interactive version here, or interact with the embedded version below; you may have to scroll right). It shows that the Russian language operation came first, with English language operations following after. The timing of this part of the activity coincides with Russia's interest in Ukraine. In the graph below, also available here, you can see how different types of behavioural strategy pay off in terms of achieving higher numbers of retweets. Using Linvill and Warren's manually annotated data, Mehmet built a classifier that enabled us to classify all the accounts in the dataset. It is evident that the political trolls have by far the greatest impact in terms of retweets achieved, with left trolls being the most successful. Russia's interest in the Black Lives Matter campaign perhaps suggests that the first challenge for agents is to win a following, and that exploiting divisions in society is an effective way to do that. How that following is then used to influence minds is a separate question. You can see a pre-print of our paper describing our work so far, in the context of the broader picture of partisanship, propaganda and post-truth politics, here. As part of the EU SoBigData project, the GATE team hosts a number of short research visits, between 2 weeks and 2 months, for all kinds of data scientists (PhD students, researchers, academics, professionals) to come and work with us and to use our tools and/or datasets on a project involving text mining and social media analysis. Kristoffer Stensbo-Smidt visited us in the summer of 2018 from the University of Copenhagen, to work on developing machine learning tools for sentiment analysis of tweets, and was supervised by GATE team member Diana Maynard and by former team member Isabelle Augenstein, who is now at the University of Copenhagen. Kristoffer has a background in Machine Learning but had not worked in NLP before, so this visit helped him understand how to apply his skills to this kind of domain. After his visit, Kristoffer wrote up an excellent summary of his research. He essentially tested a number of different approaches to processing text, and analysed how much of the sentiment they were able to identify. Given a tweet and an associated topic, the aim is to ascertain automatically whether the sentiment expressed about this topic is positive, negative or neutral. Kristoffer experimented different word embedding-based models in order to test how much information different word embeddings carry for the sentiment of a tweet. This involved choosing which embeddings models to test, and how to transform the topic vectors. The main conclusions he drew from the work were that in general, word embeddings contain a lot of useful information about sentiment, with newer embeddings containing significantly more. This is not particularly surprising, but shows the importance of advanced models for this task. Collocated with ICWSM'2019AbstractThe 3rd edition of the RDSM workshop will particularly focus on online information disorder and its interplay with public opinion formation. Workshop Theme and TopicsThe aim of this workshop is to bring together researchers and practitioners interested in social media mining and analysis to deal with the emerging issues of veracity assessment, fake news detection and manipulation of public opinion. We invite researchers and practitioners to submit papers reporting results on these issues. Qualitative studies performing user studies on the challenges encountered with the use of social media, such as the veracity of information and fake news detection, as well as papers reporting new data sets are also welcome. Finally, we also welcome studies reporting the usefulness and trust of social media tools tackling the aforementioned problems. issue of Frontiers in Big Data. submission site through https://www.frontiersin.org/research-topics/9706 (click on "Submit your manuscript"). Note, submitting authors should choose one of the specific track organizers as their preferred Editor. SponsorsThis workshop is supported by the European Union under grant agreement No. 654024, SoBigData. • Social media part of speech tagging in multiple languages — Part of Speech is one of the most widely used linguistic features to analyse social media content. The project aims to build models to tag social media content with the universal POS tag set. • Sentiment Analysis for Twitter posts — Sentiment analysis is one of the basic components used to analyse societal debates. This project aims to build a sentiment analysis model based on short and noisy twitter posts.